Ronald was born in 1920 in the UK. 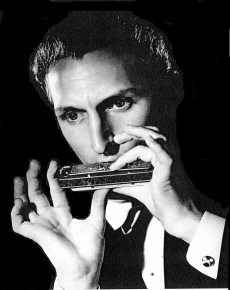 His parents were French and he was the leading British chromatic harmonica soloist until he stopped playing in the early 1960s to become a very successful comedy script writer for Radio, TV and Films. He is putting together some of his early memories so here is a brief summary until his words arrive. Ronald's first public performance was at the age of 17, and following a six month cine-variety tour, he made his first radio broadcast on the BBC's Palace of Varieties. With the outbreak of war he was asked by the BBC to give harmonica lessons to the troops over the radio. The program ran for 42 weeks and he had over 10000 letters from around the world. At the end of the war he developed a classical program and toured the concert halls for Henry Fielding. This led to a two hour recital at the Albert Hall. 5000 people heard him play pieces by Debussy, Chopin, Heifetz and DeFalla. It was very well received and was followed over the next few years by appearances at the Paladium and the Paris Lido, concert tours with Gracie Fields, and overseas visits to South Africa and Australia. Ronald played with Duke Ellington, The Suisse Romande Orchestra, and George Melachrino and his Orchestra, amongst others. He also made commercial recordings for REX, HMV and EMI. The BBC offered opportunities to chromatic solists in the 1950s. Larry Adler had moved to London and Tommy Reilly was enjoying success. Ronald Chesney was given a musical spot on the Archie Andrews radio show and Max Geldray had a similar spot on the Goon Show. This was a great period for lovers of the harmonica. Ronald became President of the National Hohner Song Band League in 1951. It changed its name to the National Harmonica League soon afterwards. By the start of the 1960s Ronald decided writing offered a better career and, with his partner Ronald Wolfe, he set out to become one of the most successful comedy writers with series like On the Buses, and The Rag Trade, which sprouted follow-ups on films and in versions for many other countries. These TV programs continue to run and videos are traded regularly on eBay. Ronald's show stopper in his Music Hall show, and probably his most famous recording, was The Flight of the Bumble Bee by Rimskij-Korsakov. Because of the speed at which he played it - and the difficulty of the piece - he developed a variation to please the musical audience and make it last longer. Here is an mp3 of a live performance of it which Ronald did with a radio orchestra in a Australia in the 1950s. Ronald continued to work with the overseas production of his scripts, and he enjoyed visiting his children and grandchildren. He did not play harmonica seriously after the 1960s, but he still loved to play jazz on his grand piano. Ronald Chesney died on 12 April, 2018 aged 98 (almost). Return to the Friends of the NHL page. Bookmark and revisit http://harmonica.co.uk for the latest details of these and other events. This page and all its contents, © 2018, all rights reserved.